Following the Kirit Parikh Panel report the Congress Core Committee comprising of Prime Minister Manmohan Singh and the party chief Sonia Gandhi are said to meet to study the recommendations put forward by the report which suggest radical overhauling of the fuel pricing system in order to reduce the burden of subsidies on the government. If the report’s suggestions are accepted a rise in fuel price is imminent. 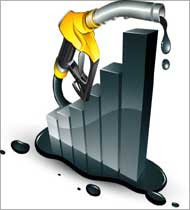 The report has a seal of approval from the Oil Ministry which suggests a reform in the pricing of fuel, deregulation of prices and proposes an increase of Rs3/L for petrol and Rs2/L for diesel and Rs50/Cylinder for cooking gas and Rs3/L for Kerosene.